The nineteenth century witnessed the consolidation of an Arab-African trading network across East Africa, and the gradual expansion of this network into the Congo in the search of new ivory fields. "[…]There were not only places where goods were stored and people gathered, such as ports and a few large markets," writes Catherine Coquery-Vidrovitch (2005:210), "but many smaller centers that we still know little about. The smaller centers may have moved from place to place and served as caravan stops, portage resting points, military posts, and slave markets on a more or less temporary basis. Together they made up a complete, structured trade network." Nyangwe played a key role in this network. Figure 1. Nyangwe. Illustration from Cameron 1877,1:opposite 378. In 1871 Nyangwe had only been an Arab trading depot for about ten years, but it was the westernmost Arab settlement in Central Africa and, along with Ujiji and Tabora, one of the three main Arab centers on the trading routes that ran from the east coast of Africa into the interior. Although environmental conditions made travel to Nyangwe difficult, the fragmentation of the local populations facilitated the arrival of heavily-armed Arab caravans (Ceulemans 1959:43). In settling at Nyangwe, Arab traders and their African forces first depopulated the neighboring villages (Stanley 1876-77:25 Oct. 1876), then attacked and displaced Nyangwe’s original inhabitants, the Wagenya (or, as Livingstone calls them, the Bagenya) to the opposite bank of the Lualaba River (Cameron 1874:4 Aug. 1874). Finally, the Arabs maintained control over the settlement through the use of intimidation and violence. Because of such violence, the Wagenya grew to distrust all new visitors to the region: "One hoary-headed old fellow said that no good to the Wagenya had ever resulted from the advent of strangers," wrote the explorer Verney Lovett Cameron, who visited Nyangwe a few years after Livingstone, "and he should advise each and all of his countrymen to refuse to sell or hire a single canoe to the white man" (1877a:2,6). Livingstone soon discovered that he would not be an exception to this distrust. Figure 2. Nyangwe Market Women. Illustration from Cameron 1877,1:379. For the Arabs, however, securing the cooperation of the local population served only to facilitate a larger goal: exploring the lands west and north of Nyangwe in order to find new sources of ivory and other trade goods. Nyangwe’s central location made it an ideal base and launching point, and, eventually, the settlement helped define a larger zone of Arab activity, influence, and, most importantly, slave trading (Stanley 1970:321). A succession of well-known Arab traders became associated with the settlement, including its founder Mwini Dugumbi and the notorious Mtagamoyo (a.k.a Mwini Mohara), the ringleader of the Nyangwe massacre (Anon 1892, 1894). Nyangwe itself grew from a "mere Arab depot," as Stanley described it (1877-78:154), into one of the major Arab trading centers west of Lake Tanganyika by the late 1880s with a population approaching 10,000 residents (Renault 1989:148). Its significance to Arab traders notwithstanding, Nyangwe also served as the site of an important African periodic barter market. This market functioned as a key point of contact between the fishing populations of the river and the agricultural communities based in the area around Nyangwe. Livingstone ([1871h] 1872:13) noted that "The market was attended every fourth day by between 2,000 and 3,000 people." Thanks to such numbers, the market facilitated trade in a wide range of items, including slaves. During one visit to the market, Livingstone (1871a:297c/115) had the opportunity to question slaves taken from at least nine different regions beyond Nyangwe. 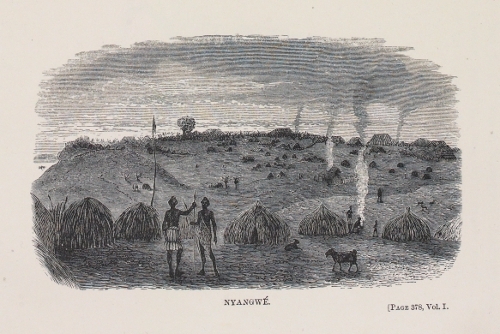 Because of Nyangwe’s location, the market also provided a crucial link between the great Luba Empire centered in the savannah lands to the south and the Lega people scattered through the rainforest to the north (Biebuyck 1973; Reefe 1981). Figure 3. Selection of items available at Nyangwe taken from texts by Livingstone, Cameron, and Stanley. 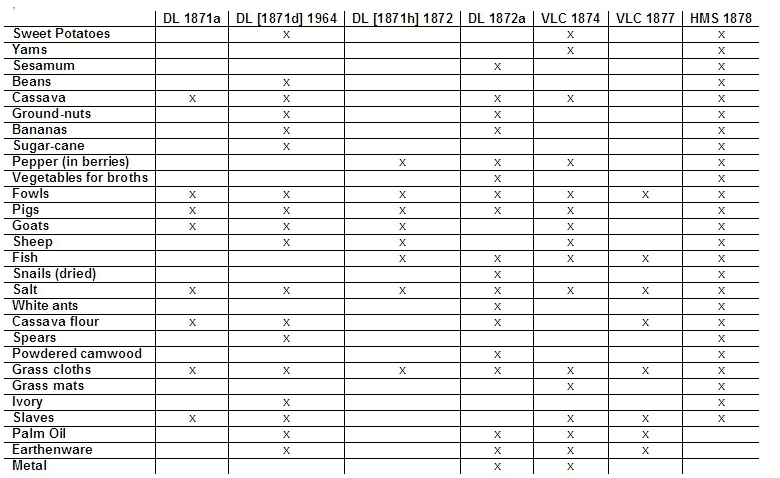 Chart by Adrian S. Wisnicki. Nyangwe’s cultural and economic role alongside the rise of Arab trading in the region, therefore, ensured that the settlement facilitated interaction among a variety of groups: the Arabs and their forces; slaves transported to Nyangwe by the Arabs; the Luba and Lega communities; the diverse ethnic communities residing in the vicinity of Nyangwe; and, finally, the Wagenya fishermen, who were linked to these others groups through control of traffic on the Lualaba River. 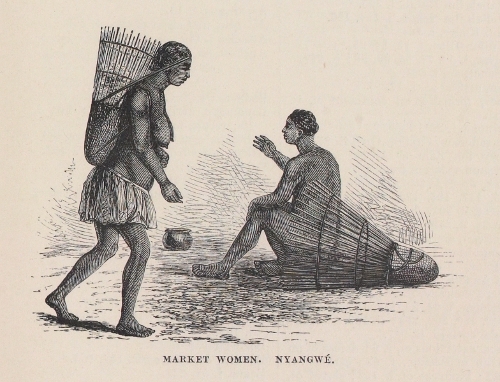 The items available for trade in Nyangwe reflected the diversity of the populations that frequented the market, and included local products such as fish – fifteen different types by Livingstone’s count ([1871h] 1872:13), products transported across longer distances, and items introduced by the Arabs.